The xwashier marker at Schokland. 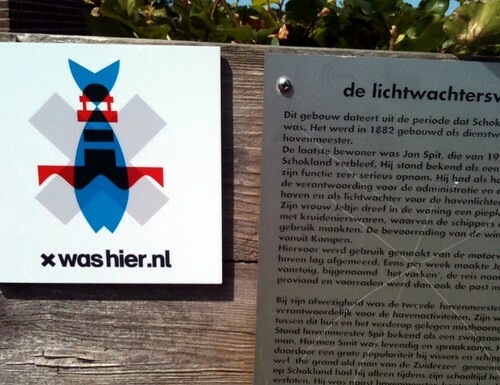 Last week we silently launched our new project xwashier, or “x was here” in English. In many ways, it’s the pinnacle of our view on museums, media and technology. And, unlike most of our projects, xwashier is also available in English. Partly. The full website www.xwashier.nl now gives access to 45 locations. The English one, www.xwashere.nl for now only to Manhattan, but it gives an OK impression of the project. Each location is presented with a movie, presented by Hans Goedkoop. Also, on the Dutch website every location has a unique cartoon, specifically drawn for the occasion (the Manhattan one is embedded below). Of course, the website is connected to the INNL network of historical communities and collections. The xwashier cartoon of Manhattan. Every location has such a cartoon. The iPhone app gives access to all the information on the website. In addition, it allows people to check into locations by ‘scanning’ the physical marker. By doing so people can earn badges and win prizes. The project tries to connect the physical and digital world, without excluding the full experience of either one. Hopefully you don’t need the app to enjoy the physical space, and hopefully you can get a pretty good impression of the physical space through the website. The use of video and cartoons rather than (a lot of) text to tell about history is something I’m enthusiastic about. I can see how some people will find this “shallow”, but I certainly hope we can attract new audiences by using these media. The app has a very clear goal: to show you something historical nearby that has a good presentation (as opposed to giving a map full of stuff). I hope this easy approach, combined with the badges and prizes, will get people to use the app more than once. I’m really curious to see how the relation between our app, and other location-based media with which I tried to connect xwashier will develop. (I’ll write some more about this when I discuss the online media campaign around xwashier). Xwashier was developed together with Fabrique and Vandejong. I believe they’ve made a slick app, definitely worth a download even if you’re a non-native Dutch, and a straightforward website. Thanks guys. I believe I missed a thing or two I should definitely have mentioned. However, today the carefully crafted and utterly chaotic launch campaign got some traction, so I’m a bit all over the place. Will blog about that too, as said earlier. It involves using people’s egos, careful monitoring and some really surprising results. Stay tuned! An example of a xwashier movie: Manhattan.